Macular degeneration is also known as Age-related Macular Degeneration (AMD). This is because the disease develops as we age. It is a degenerative condition affecting the central area of the retina called the macula. It is also the leading cause of irreversible vision loss. Whilst the main cause of AMD is not fully understood it is most commonly noted in those over the age of 50. Other than an increase in age, macular degeneration can tend to be found clustering in families that suggests that there may be a genetic association. Smoking, obesity and high blood pressure are also risk factors of AMD. Vitamin supplements can reduce the risk of AMD related vision loss. Dry AMD is the most common, develops gradually and can cause slow progressive loss of vision. Characterized by the presence of yellow deposits, called drusen, in early stages it does not result in changes of vision however if they develop in size or increase in number they can result in a distortion of vision. The dry form of AMD can lead to the wet form of AMD. Wet AMD sees the growth of abnormal blood vessels resulting in blood and fluid leaking beneath the macular. This is also called choroidal neovascularisation. The result of this causes a distortion in vision, blind spots and can severely impact central vision. Although a small proportion of people with macular degeneration develop wet AMD, they are the group who unfortunately experience vision loss. With wet AMD, vision loss can occur quickly. Because the disease impacts central vision, the first symptom is usually blurred or distorted vision and empty spots, similar to the effect noticed after looking directly at a light. People can also have difficulty reading especially in low light. 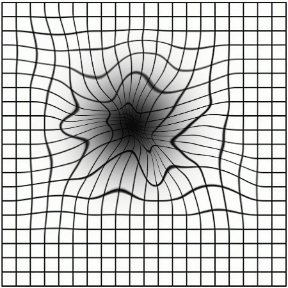 Artists rendition of a square grid when viewed by a person with macular degeneration that shows vision artefacts such as dark spots and distortions. At this point in time, there is no cure for AMD, however, there are treatments available which work to maintain a patient’s central vision for as long as possible. The treatment of choice will depend on the severity and whether it is dry or wet AMD. The most practical treatment for the presence of dry AMD is regular observation by a professional eye practitioner. Changes in diet are often recommended, including increasing the consumption of leafy green vegetables, oily fish and AREDS 2 vitamin supplements. During eye examinations, it is likely that the Amsler grid, a tool used to detect vision problems, will be used to detect any progressive damage occurring. Intravitreal injections (eye injections) are commonly used in the treatment of wet AMD where anti-VEGF medication is injected into the eye. Whilst the addition of supplements and the cessation of smoking can help reduce the risk of progression, eye injections are found to be the most effective treatment. Regardless of whether you present with dry or wet AMD, it is very important to have your eyesight monitored regularly. Macular degeneration can progress quickly however, effective treatments are available to preserve your central vision for as long as possible. If you have questions about macular degeneration or to discuss available treatments, contact Westside Eye Clinic today – Phone: 07 3715 5555.